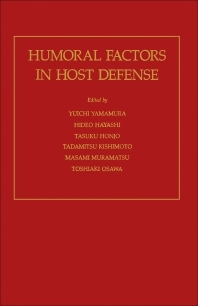 Humoral Factors in Host Defense contains the proceedings of the First Takeda Science Foundation Symposium on Bioscience, held on October 28-30, 1982, in Kyoto, Japan. The symposium focused on the humoral factors regulating immune responses, with emphasis on T cell-derived immunoregulatory molecules; molecular mechanisms of interferons; factors involved in differentiation and activation of immunocytes; and the use of the molecular genetics approach to host defense factors. Organized into four parts encompassing 22 chapters, this volume begins with an overview of interleukin-2 and T cell-replacing factors, along with their immunological functions and biochemical features. It then discusses antigen-specific T cell factors; immunoregulatory molecules from human monoclonal T cells; physiological and pathological roles of lymphokines; regulation of the immune system by monoclonal T cell peptides; production of a glycosylated human protein by recombinant DNA technology; and molecular genetics of immunoglobulin genes and the major histocompatibility antigen. Geneticists and biologists will find this book extremely useful.